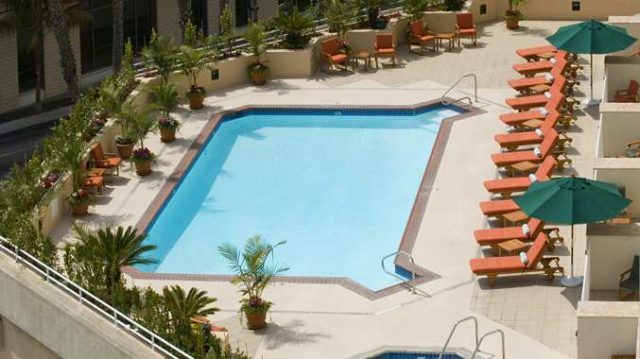 The DoubleTree Hotel Santa Monica is perfect for families visiting Santa Monica, California! It’s in the perfect location and the rooms are large. I’ve stayed there twice and would recommend it to everyone! Last month, when we went on our family vacation to Disneyland, we also visited Santa Monica for a few days. I went last year for a girls trip and realized that my family would love it too. It’s very walkable and you have plenty to do; the beach, the pier, and shopping. Plus, it’s somewhat centrally located to attractions like Hollywood and Beverly Hills for day trips into Los Angeles. 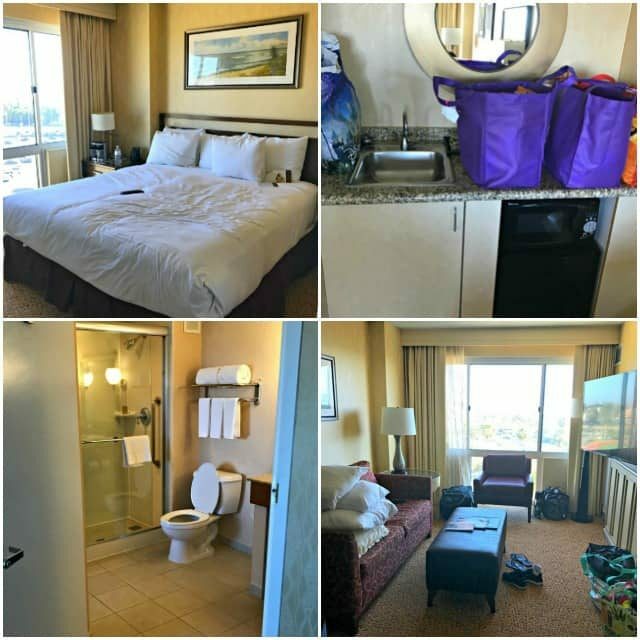 When we travel, we like to stay in a suite because that way, the adults and kids can have their own space. This time, we wanted that even more so because we brought one of Jordan’s friends with us on vacation. It would have been very awkward to all be in one room. The DoubleTree Hotel Santa Monica is the perfect hotel because it’s ALL suites. I’ve stayed there twice now and would recommend it to everyone. Obviously, the thing that’s most important about any hotel is the ROOM. The DoubleTree Hotel Santa Monica is an all suite hotel so you never have to worry if one will be available. There are two kinds of suites; rectangular and square. We stayed in a square type room and I would recommend this room if you’re traveling with a family. The long rectangle rooms have a living room when you enter, followed by a bathroom, then the bedroom. The square room has a living room when you enter, the bathroom too the side and the bedroom next to the bathroom. The perk of the square room is that there are two entrances to the bathroom: one from the bedroom and one from the living room, making it a jack-and-jill style bathroom. Plus, there is an added vanity area outside the bathroom, just inside the bedroom. When you’re traveling with children, it’s nice that there are two entrances for the bathroom so you don’t have to enter where they’re sleeping during the night if you need to go. The vanity area gave us some extra room for getting ready (4 people – 3 of them girls – with only 1 bathroom!) and because the bedroom was closer to the front door it was easier for us to sneak out in the morning while the girls slept in. The rooms also have a mini kitchen with microwave, refrigerator, and small sink, which is necessary when traveling with kids. Breakfast doesn’t come with the room, but because you have a fridge it’s easy to make cereal in the morning, or even pack lunches for the beach. Both rooms have flat screen TVs and there are plenty of plugs for all the devices to charge. The other perk of having a HHonors Membership is that you get to pick your room on the Hilton app. The day before you arrive, you’re able to check-in and at that time, you can choose your room. This is important because you can make sure to get a square room AND you can choose one with an ocean view. In the app it gives a diagram of the hotel. Pay attention to the streets and you can pick one on the ocean side. The location of the DoubleTree Hotel Santa Monica is perfect. While I would love to stay right on the ocean, those rooms are $500+ for a basic room. The DoubleTree Hotel rate is only $200-$350, depending on time of year. Still pricey, but less than on the beach, and it’s totally walkable. If you head left out of the hotel, it’s just a few short blocks to Main Street where there are tons of shops and restaurants. Head straight away from the hotel and you run right into the beach and the pathway that’s perfect for running or walking. Walk a few blocks behind the hotel and you’re at the 3rd Street Promenade, with tons of shops are trendy restaurants, as well as the entrance to the Santa Monica Pier. You do not need a car if you’re staying at the DoubleTree Hotel Santa Monica, unless you want to do day excursions to Hollywood or Beverly Hills. They’re just about 30 minutes away, so this is the perfect location that’s away from the craziness of downtown LA. Plus, uber is very mainstream in Los Angeles and you can find one within just a few minutes of where you are at any given time. The pool at the Doubletree is actually really nice. It’s not a resort pool, but the hotel isn’t a resort; it’s a hotel. For a basic hotel pool, it’s perfect to cool off in after a long day of shopping, and the kids love it. There’s a hot tub and there are chaise lounges to relax in. You can also get service from the bar while you’re relaxing poolside. The staff at the DoubleTree Hotel Santa Monica are wonderful. They’re kind, helpful, and prompt. The valet is always helpful with directions, housekeeping responded promptly whenever we needed anything. Room service was fast as well. There are three restaurants at the hotel: a Starbucks in the lobby, 4th Street Grill, and Jazz Loft. We didn’t use the Starbucks in the hotel (there is a full service one close by) but we did eat food from the Grill and the Loft. The 4th Street Grill is a full service restaurant that’s open for breakfast, lunch, and dinner. They also serve the food at the pool, for room service, and the appetizers for the bar. The food is good, hot, and made quickly. Mainly, we enjoyed our time at the Jazz Loft. They have a daily happy hour that Mel and I attended, and you can get food brought up from the restaurant downstairs. It was quiet and never very busy, and the happy hour wine pours were VERY generous. Of course, the cookies. I always forget that every DoubleTree gives you cookies upon check-in. They’re some of the best chocolate chip cookies I’ve ever had – and they’re served warm, too. Of course, as soon as I got back I had to make a copycat of them. 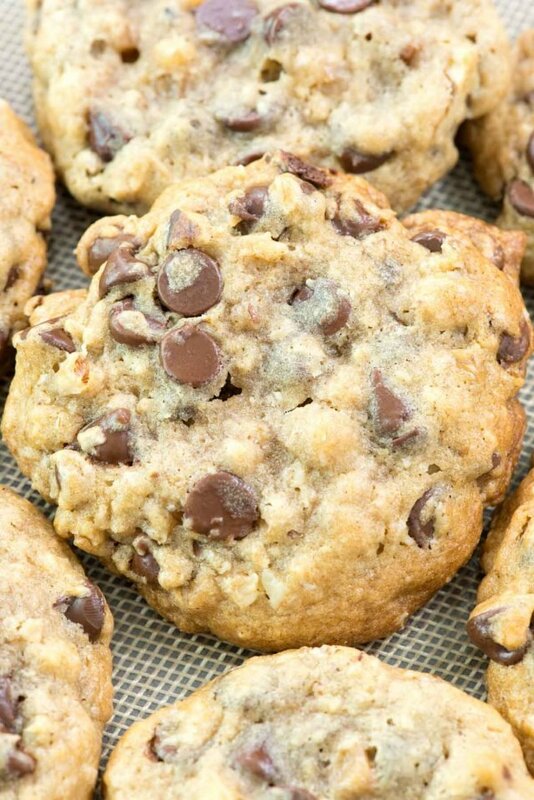 Get the recipe for my BETTER than DoubleTree Cookies here! Overall, I totally recommend the DoubleTree Hotel Santa Monica. It’s perfect for families, or even a business traveler who wants to be at the beach and not have to explain a $600 room charge to his company. If you’re looking for a great place to stay on the beach in LA, it’s one of my favorite places! Some of my blogging friends have recommendations for other things to see and do in California, too! Anetta (The Wanderlust Kitchen) took a California road trip to the San Francisco area, and Cathy (Noble Pig) had some California travel fun, riding the Skunk Train through the Redwoods! The hotel provided me a media rate in exchange for social media and a post. All opinions are 100% my own.